We are excited to announce INSPIRE beta, a sneak peek into the future of INSPIRE! Built on top of a modern and reliable software architecture, INSPIRE beta aims at bringing the best out of the existing INSPIRE features while introducing new ones. The High Energy Physics community’s feedback has always been part of shaping and improving INSPIRE; by launching INSPIRE beta to the community we enable an even closer connection, which helps us to deliver a new and better INSPIRE platform based on user needs. That’s why INSPIRE beta is running in parallel to INSPIRE, while we work on ensuring that it will fully satisfy the needs of the HEP community. For the time being, users need to login via ORCID in order to try out INSPIRE beta, but the final platform will be available to everyone without any login required, same as the current INSPIRE platform. You will see a powerful search, new filters (facets), and a new look-and-feel of search results and author pages. Feel free to dive in, try out INSPIRE beta and tell us what you like and what we should improve via this feedback form. The new facets allow users to refine their search. You can search by date, author name, subject, arXiv category, experiment and document type. Additionally, following user requests, we added a new facet to filter out papers with more than 10 authors. The facet works similarly to the author count SPIRES operator (ac 1->10). Citations are a very core function of what we do; INSPIRE aggregates content from many sources with often updated references. Currently, INSPIRE has 4 different algorithms for calculating citations, which can lead to discrepancies. In INSPIRE beta we implemented a new algorithm to calculate stable and accurate citations. So what does that mean for you? As we are still fine tuning the algorithm, you might encounter small citation differences between the two systems. For more info on new features and known issues, please visit our help page. The 2016 edition of the annual topcites list is still very much dominated by experiment, in particular the discovery of the Higgs boson in 2012, with the ATLAS and CMS papers at the  and  positions as they have been since 2013 (joined by the ATLAS and CMS instrumentation papers [12,13]). Indeed, they have now cracked the top ten of the all time list, where they are the only papers from the 2010s and, together with the 2006 PYTHIA  and 2002 GEANT4  papers, the only papers from this century. The ATLAS and CMS collaborations produced a joint paper in 2015 on the Higgs boson mass and it makes its first appearance in the Top Forty this year . The papers from the 1990s on the AdS/CFT correspondence [5,14,20] continue to be strongly represented. A breakthrough paper from 2006 by Ryu and Takayanagi , which connects entanglement entropy and Bekenstein-Hawking entropy, has made its first appearance in the Top Forty list as interest grows in the connection between quantum information concepts and quantum gravity. Aside from these papers, all of the theoretical papers in the top twenty are resource papers centered around LHC-relevant simulations [4,6,7,8,9,16,19]. The 21st century simulation codes Sherpa and POWHEG make their first appearance on the Top Forty list this year [35,38] following a long, steady climb in their annual citation rates [2008 paper, 2004 paper]. Away from the LHC-zone, observational cosmology rules the top twenty, with familiar favorites [3,10,15,17,18] and one very important newcomer , to which we now turn. The gravitational wave discovery paper  by the LIGO Scientific and Virgo collaborations appeared simultaneously in Physical Review Letters and on arXiv.org in February. By April it had 200 citations and by July 500 citations. In late December Science Magazine named this discovery the Breakthrough of the Year for 2016. So far this seems to have exerted little influence on the rest of the topcite list (though one can detect an uptick in citations of Einstein’s original GR paper and his 1937 paper on gravitational waves). It will be interesting to see what happens in 2017. The other big news of 2016 was the possible di-photon (or gamma-gamma) excess reported in December of 2015 by ATLAS  and CMS  in papers that were, unprecedentedly for the Top Forty list, neither arXiv eprints nor journal articles. As a potential signal for New Physics, this precipitated an intense period of research. The observations generated more than 400 theory papers citing the ATLAS and CMS reports. This collection of theory papers acquired a Hirsh index of 92, that is 92 of these citing papers themselves garnered at least 92 citations. Publishing these theory papers was a matter of controversy. JHEP declined for some time to publish any theory paper explaining the resonance; Physical Review Letters chose four to illustrate the ferment in the particle theory community. Finally at the ICHEP conference in Chicago in August it was announced that the signal disappeared when studied in the larger LHC data set accumulated in 2016. In the still-relevant words of Maurice Goldhaber, “not all candidates get elected”. The remainder of the list includes familiar papers from previous Top Forty lists. On the theory side are more LHC-relevant simulation papers [22,23,25,28,30,31], Hawking radiation , inflation [26,34], large extra dimensions  and neutrino mixing . The list is rounded out by the first resullts from LUX on dark matter  (the final results from LUX appeared in August, too late for this edition) and the update of cosmological parameters from the full WMAP data set . – Heath O’Connell and Michael Peskin. Traditionally DOIs (Digital Object Identifiers) have been associated with published papers in the digital era, but papers are not the only research objects that physicists may want to search, use, and cite. We talked with Jim Simone of Fermilab about his efforts to get DOIs assigned to MILC collaboration datasets and to get records of them uploaded to INSPIRE. How is Jim involved with the MILC collaboration? Jim is a member of FERMILAB-LATTICE collaboration, which works closely with MILC on scientific projects involving matrix elements and flavor physics. MILC generates data sets consisting of lattice gauge configuration files, which the collaboration has made openly available for others to use, as is increasingly becoming required for federally funded research in the U.S.
What is the MILC collaboration’s connection to the International Lattice Data Grid (ILDG)? Jim was an early organizer of the ILDG, which is intended as a data grid to enable collaborations to share gauge configurations. The ILDG metadata catalog had its limitations; it only held limited kinds of metadata, sometimes making it difficult for people to find what they were looking for. People involved with the project have been trying to fill in the gaps, including the biggest problem: connecting scientific papers produced by the data to the datasets. Rather than reinventing the wheel, ILDG is considering to use INSPIRE as a catalog to connect papers with datasets, making the data usable and findable by all physicists, including HEP and nuclear phenomenologists, as ILDG is currently only used by lattice scientists. In INSPIRE the datasets and associated papers can be searched starting with the papers in order to see what configurations were used to get the results, though in the upcoming version of INSPIRE, the Data collection will be made public and searching will also be possible starting with the individual datasets and from there finding what papers were produced from these configurations. References in INSPIRE record of a paper that cited MILC datasets. Why and how did Jim go about getting DOIs assigned to the datasets? What challenges did he face? Jim believes DOIs, as public, persistent identifiers, are a natural mechanism to identify the datasets, which are public, first class data objects, and permanent. With DOIs, the configurations will be better integrated into the ILDG and INSPIRE. In the case of published papers, DOIs are assigned by publishers, but this route would not work for datasets. While INSPIRE is equipped to directly issue DOIs, MILC’s direct connection to the U.S. Department of Energy (DOE) made it practical for DOIs to be issued by DOE Office of Scientific and Technical Information (OSTI). In either case, DOIs are registered with the central agency DataCite. ILDG has started a discussion on how other groups can get DOIs for their datasets. Outside the DOE, CERN also issues DOIs, and regional ILDG groups can help members get DOIs and serve as gatekeepers to keep the metadata clean and clear. 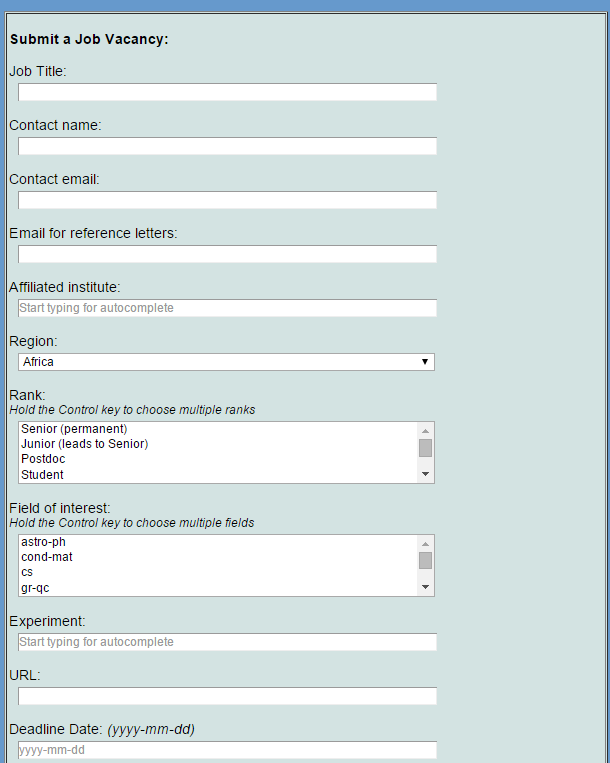 DataCite can also help researchers find registration organizations. Beyond getting the DOIs assigned, another challenge was figuring out how citations should be marked up in papers, both written and digitally. With the goals of making the datasets findable and identifiable, Jim and the ILDG wanted people to be able to see the DOI in a print version of a reference list as well as click it in a digital version. In order to make the process as transparent as possible for people citing the datasets, Jim worked with us to include instructions in the metadata of the INSPIRE records and OSTI records. For researchers unsure of how to cite datasets that do not include specific citation guidelines in their metadata, DataCite and CrossRef have developed a DOI citation formatter that can take a DOI registered by either of these services and format its citation in a variety of styles. When going through the publication process with a paper that used MILC configurations, Jim found the referees and copy editors weren’t familiar with how the citations should appear. Most objects with a DOI are published papers that can be cited in written format using a journal reference, volume, page range, etc., so the DOI is often left out of the text of a reference list. However, following this standard would not make the datasets adequately identifiable to the human eye. The community known as FORCE 11 (Future of Research Communication and e-Scholarship) has developed eight principles of data citation practices with equal emphasis on human readability and machine-actionability. As these recommendations become more widely endorsed in research communities and researchers become accustomed to citing datasets in their papers, the issue of human identifiable data citations will most likely be resolved. What advice does Jim have for others looking to make their datasets more findable and citable? Jim has two pieces of advice: get DOIs and mark up the metadata in a way that’s sensible for the community who will use the datasets. DataCite makes this simple by being explicit about its mandatory metadata requirements, while also allowing for additional recommended and optional metadata. At INSPIRE we look forward to integrating more dataset DOIs into our records. Send your questions and comments about dataset DOIs in INSPIRE to feedback@inspirehep.net. Read the post in English here. The annual INSPIRE Topcites list provides a snapshot of the topics that were of greatest interest in a given calendar year. To maintain the focus on HEP, we construct the list by considering only citations from core papers. To be complete, we also provide individual Topcite lists for each arXiv category we cover. Continuing a recent trend, the 2015 Top 40 list is virtually unchanged from the previous year, save for a little re-shuffling in the middle order and the quantum fluctuations of classic papers near the bottom. The leading five papers from 2014 securely held their positions, with almost 150 citations separating Maldacena’s 1997 AdS/CFT paper at number  from this year’s number  paper, the 2002 GEANT4 description paper (which itself was seventh last year). The first new paper on the list appears at number , a Planck paper on cosmological parameters that updates the results of a 2013 Planck paper . Since its posting in February 2015 this paper has collected over 700 citations and brings to four the total number of Planck papers on the list, including another February 2015 paper on inflation  which, again, updates a 2013 paper . At number  we have the second paper making its debut, a 2014 descendant of the 2011 MadGraph5 paper , describing a software package for automatically calculating cross sections at next-to-leading order. suggesting a strong showing by them in future topcite lists. INSPIRE blog now also available in Chinese! The INSPIRE service is operated by a global consortium, including IHEP in Beijing , We strive to connect the global High-Energy Physics (HEP) community, indexing over 1.000.000 relevant publications and offering accurate author profiles with citation statistics. . To celebrate our global reach, and serve the diversity of our community, some of our blog posts relevant to the Chinese HEP community will also appear in Chinese on our pages. INSPIRE is committed to keep up with all the new publications in the field of high energy physics. As part of that, over the years, INSPIRE has managed to collect more than 30.000 theses! 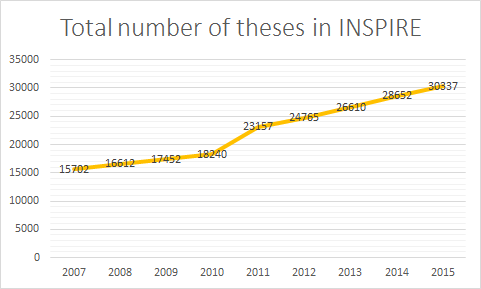 Only last year INSPIRE added more than 2000 theses to its collection. Approximately 70% of them are Phd level. 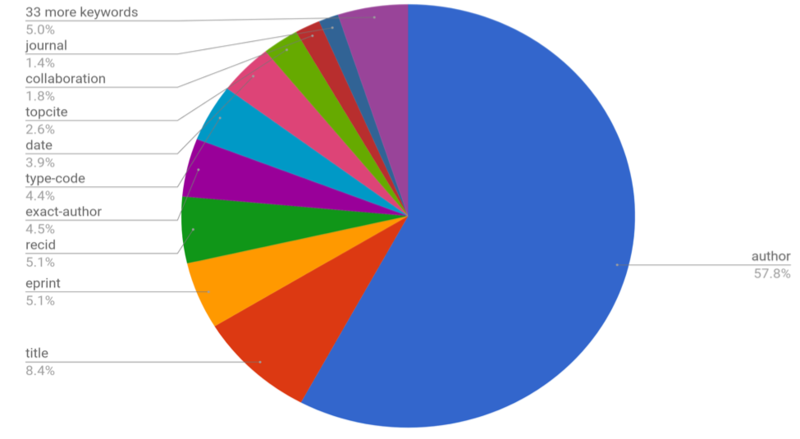 Although theses only cover the 3% of the total HEP publications collection, they made up 40% of user submissions in 2015, so it is noticeable that there is a large demand for better coverage. Finding all the theses concerning the HEP field every year from around the world is a very difficult task. While the focused and devoted INSPIRE team constantly searches for new publications, it might not find all of them, which is why we need your help. As with every other publication on INSPIRE, when submitting a thesis a person, is automatically given an author profile, which will include his first publication. In case this publication is not his first the author profile will already exist and it will get updated. 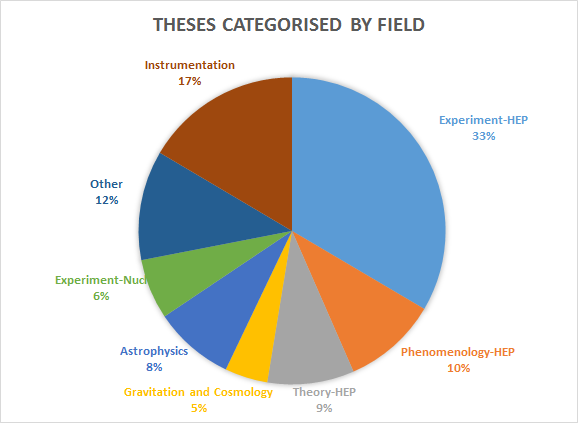 For all of these reasons we recommend that all students who want to start building their career in high energy physics should suggest their thesis to INSPIRE. . Moreover, professors and supervisors should also encourage and recommend this action to their students. Please note that for those of you a CERN, we take theses available on CDS automatically. If you are interested in submitting your thesis to INSPIRE, check out INSPIRE labs. All the analytical steps and directions that will guide you through the thesis suggestion process can be found here. Interested in what we have been working on? Drop us a line at feedback@inspirehep.net and stay tuned to our Twitter and blog for updates! If you haven’t heard about the THOR project, you’re missing out on a lot of changes in the open scientific community and the forces that drive these changes forward. THOR is a 30-month project funded by the European Commission. Its purpose is to establish seamless integration between articles, data, and researchers across the research lifecycle. This will create a wealth of open resources and foster a sustainable international e-infrastructure. THOR started this June and its goal is to improve the interconnection of the existent persistent identifiers so that a researcher will not have the need for multiple persistent identifiers that provide information only for a part of his research. Moreover, it aims to form economies of scale, enrich existing research services, and create opportunities for innovative solutions throughout the lifecycle of scientific research projects. THOR’s main goal is to create sustainable services, not just prototypes or proofs of concept. These services will be built to be accessible to all researchers, no matter which discipline, institution or country they work in. The INSPIRE team at CERN, along with DataCite and ORCID, will collaborate with the British Library, EMBL, DRYAD, ANDS, PLOS, Pangaea and ELSEVIER, organisations and publishers from a variety of scientific fields. Enhance the expertise of the European research community by running an intensive training program, and creating a knowledge base for practitioners integrating PIDs into research information systems. Because of the nature of the community and the existing infrastructure that INSPIRE has built over the years, it is one of the most significant THOR project partners. INSPIRE’s database and author profiles are perfect candidates for the integration of the two PID-based services mentioned, ORCID and DataCite, which present a way to create a bidirectional connection with other scientific communities and repositories. These kinds of features improve the workflow of the users of INSPIRE by building seamless connections to other services such as HepData, which connects the author’s research papers with the corresponding data, and more importantly promote a new era of “open-access”-friendly scientific information services. If you are interested in project THOR and/or have questions about the actions it promotes, feel free to contact us at [email-address], follow project THOR on Twitter, or leave your comments below. In 2010 we moved the Jobs Collection from SPIRES to INSPIRE; 5 years later, this collection is one of the most visited and active on INSPIRE. Here are some statistics to illustrate how important the “Jobs Collection” appears to be to you. 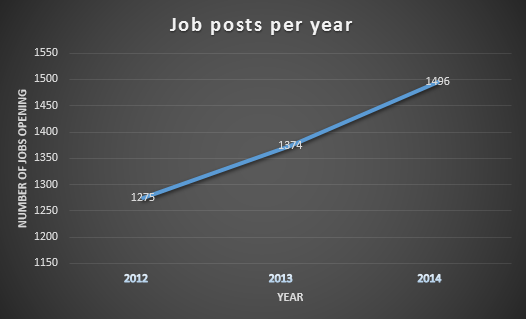 As you can see in Figure 1, the number of jobs that were posted in INSPIRE has increased a lot during the last 3 years. This is happening thanks to our colleagues’ efforts to scan all of the HR sections of the official webpages of the world’s scientific labs and universities to include related job postings. To make it easier for you to find the best job suited for you, we offer you compact and summarized information through features such as the job matrix. In Figure 2, we notice that the use of the Jobs Collection continues to increase throughout the years and follows specific patterns. We can observe a seasonal growth of the traffic every fall, along with a general yearly 13% growth in traffic from 2013 to 2015. This only means for us that the service is an essential part of the scientific community’s workflow, a page that stays bookmarked for our users and is strongly connected to your quest for new opportunities and objectives. Our goal is to to serve the scientific community, so we will continue to gather more sources and to extend the coverage of this collection. After analyzing this data, another interesting point that comes up is the scientific fields and the position levels that are offered through INSPIRE. In Figure 3 and 4 you can see the distribution of the offered positions, based on the field of physics and position level. 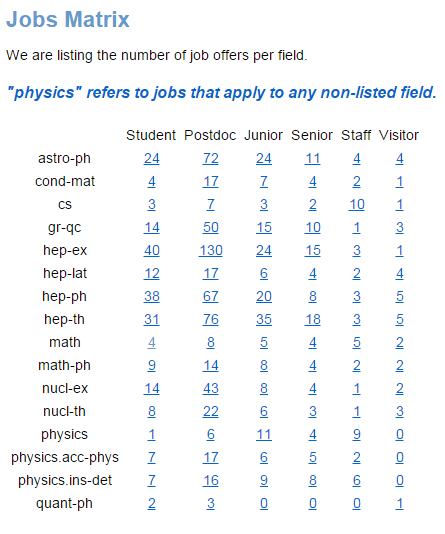 As you can see, while INSPIRE is mostly useful for the HEP community, you can also find postings from many other fields of physics such as astro-ph. You find such job postings in an organized fashion by browsing the Job Matrix. Finally, it is very interesting to track the breathing cycle of academia (Figure 5). 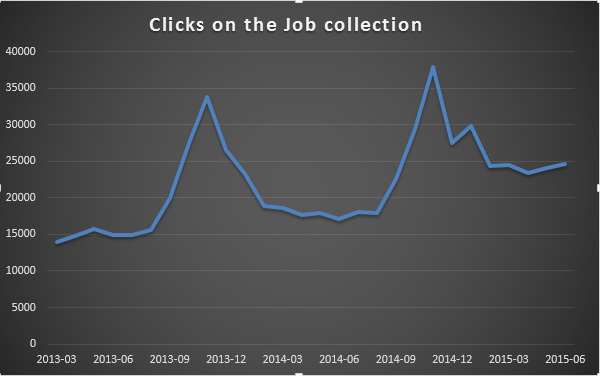 Even if there were some slight changes through the years, we can notice that almost every year during September, October and November,the number of Job posts increases. Keep that in mind when you consider starting your job hunt. We hope that we’ve cleared up some things concerning the Jobs section. We wish the best of luck for all of you who are currently seeking a job. For further information do not hesitate to contact us at jobs@inspirehep.net. INSPIRE cares for its community and always tries to find the best ways to address people’s academic and research needs. “Jobs” is a very important collection because it provides a solution both for Institutions who are searching for new staff and for people who are searching for a job. If you have openings for positions in High Energy Physics and related fields, you can post your vacancies on INSPIRE. This is a quick and easy procedure. For students, postdoc, junior, senior, temporary and staff positions in the general field of physics, INSPIRE is a great place to search for candidates. 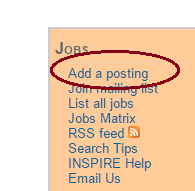 If you want to post a job, go to INSPIRE Jobs and “Add a posting” (Fig.1). The next step is to fill out a form (Fig.2) that will provide us with all the necessary information about the job you want to post on INSPIRE. This form will help you specify your exact needs for an employee and inform people of all the required qualifications. Not all fields are mandatory; however, the more information you provide, the easier it will be for people to find the posting and for you to attract more applications. Finally, after submitting your job, a confirmation message will be sent for your submission. You cannot spot the job you submitted immediately, as it will be visible only after being approved by our staff. When this procedure is completed you will receive an e-mail, so make sure to provide a valid email address. If you are interested in searching for a job or studentship in physics, we have implemented a search algorithm that will help you find the right job for you. You can refine your search by level of the job, (junior, senior, phd, etc. ), region (Europe, Asia, etc.) and field (astro-ph, cond-mat, physics, etc.) as you can see in Fig.3. With the Job Matrix (Fig.5), you can see how many positions exist at the moment that match your specifications and start applying. You can stay updated for new vacancies by subscribing to the RSS feed or by signing up to our mailing lists, which you can find at the bottom of the result pages or at the orange box (Fig:4). If you found this blog post interesting, stay tuned with our blog and twitter to read our next blog post about the importance of the “Jobs” collection to INSPIRE!